Of course I believe in coincidences. They happen all the time. What I am doubtful about is that they mean anything. For a start if they meant something then they wouldn't be coincidences by definition. Furthermore as discussed in a recent blog the human mind is trained to see patterns in things above everything else so any such interpretation should be taken with a pinch of salt. At the beginning of 2014 I finished the first draft of my latest novel. Like the previous one it was partly set in and around the music industry, this time in the early nineties. The central character - who'd been a supporting character in the previous one - was the singer in an indie band, a band described in the book as shoegaze but with more aggressive vocals than was usual. I must admit that when I was first writing I didn't know exactly what the band (Beam - a very nineties name, I could almost see the logo on the t-shirts) sounded like although I knew that I would have loved them and probably made an effort to go and see them play outside London. However when starting the revisions at the beginning of 2014 I gave this some more thought and it suddenly struck me that of course Beam would have sounded a lot like Bleach, a four piece from the early nineties whom I did rather like (even though I only got to see them a couple of times). I wondered if perhaps my subconscious had been telling me that all along given the similarity in the bands' names and lineups. After this realisation Bleach's entire canon became my playlist when performing the edits. I had forgotten just how good they were - and criminally underrated. I tweeted about them occasionally, trying to see if anyone else shared my retrospective passion for this music. But no. Then just after I finished the first set of revisions (a process which had taken me the best part of a year) I read Caitlin Moran's novel "How To Build A Girl" and was pleased to see that Bleach and singer Salli were namechecked. So it turned out I wasn't the only one to remember them. And then on Twitter, journalist Simon Price tweeted that Bleach had reformed for a one-off gig and would be playing their hometown of Ipswich for one night only in June. I didn't even have to think once - I booked a ticket. I would worry about getting to Ipswich and where to stay when I got there later. The first half of 2015 was quite turbulent for me what with one thing and another but June rolled around soon enough, by which time I'd bought advance train tickets and booked a room in a bed and breakfast (although in keeping with what I'd discovered when travelling around the country over the past year playing bass with Das Fluff breakfast was not included). I was actually quite nervous on the evening. I had absolutely no idea why. I was quite used to going to gigs on my own - it had been my modus operandi for the past twenty years from hitching round the country to see Lush and Die Cheerleader in the nineties to walking to the Brighton Dome to see The Jesus and Mary Chain perform Psychocandy in full only a few months ago. I caught the bus from the B&B into Ipswich town centre and then used the map app my phone to guide my walk to the venue. The surroundings were completely unfamiliar - I was sure I must have been to Ipswich before but couldn't have said when. Part of my anxiety was to do with the uncertainty of finding the venue. Surely this was the wrong place - it looked like a church not a venue. I nearly pulled up the Facebook app to check the event address. And then inside a glass case - which would have been more suited to displaying the latest parish newsletters or information about evensong - was a gig poster on which was a very familiar logo. A logo which probably influenced some of my own early graphic design decisions, a logo which looked as if it had been created by blowing up some text on a photocopier, shrinking it again and then blowing it up, repeat to distress. The disintegrating look of the logo actually added to its strength due to the flaws being repeated on every iteration of the thing, from record and CD sleeves, t-shirts and now a poster in front of me here stranded in the middle of 2015. Bleach. Inside was even odder. Despite the stage at one end upon which the equipment had been set up (in front of a backdrop containing another iteration of that familiar logo) the rest of the interior was still very much a church . You almost expected the vicar to appear from behind one of the pillars "Now I hope it's not going to be too loud..."
I was there too early due to my perennial fear of missing something important. I punctuated the next couple of hours by watching the supports, popping outside for a cigarette and buying a couple of beers from the makeshift bar in the narthex. But eventually the wait was over and I drifted towards the front. I had come all this way and I suspected that the claim that this was going to be a one-off was genuine. I didn't want to miss a moment. The set list was visible on the stage in front of me but I avoided focussing on it I didn't want to know what was coming. All of the songs would be drawn from the Bleach canon and I knew them all. The gig started and the wall of sound was exactly as I had been expecting, this familiar noise which I had only experienced live a couple of times half a lifetime ago but which for the bulk of the time between now and then had been listened to in solitude, on my walkman, iPod or phone, transcribed from vinyl, laser etched plastic or binary bit into this aural assault. As the songs washed over me I began to feel emotional, tears springing to just behind my eyes. But why? Was this something to do with how long it had been since I had last heard these songs live or perhaps something to do with how often I had listened to them by myself? But overanalysing it would have been the same as fiddling with my phone throughout the gig - I was here to enjoy this unrepeatable experience and after a few moments I put away both my phone and my analysis and simply immersed myself in the event, letting it wash over me. And in a way it was. I could experience what I had been telling myself about my own life afresh, like youth but with the important added knowledge that this was all finite, never to be repeated and therefore precious. And of course this applies to everything. When we are young we think we are immortal and can keep doing everything forever. But we can't. 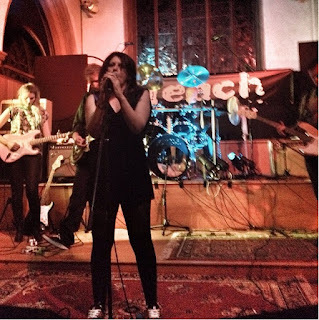 For a far more relevant and eloquent account of Bleach's brief comeback I strongly recommend you read singer Salli's blog at justwordsandmusic.wordpress.com. Thank you for writing about this one off gig, Chris...I'm glad you could make it. It's been a strange but very happy experience playing together again after all this time. It's great to know that we could share it with you. Salli - Thank you for reading and more importantly for playing the gig! I am glad I could make it.